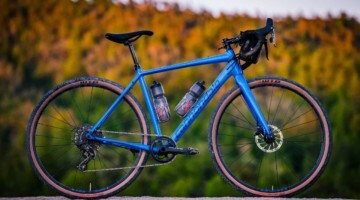 Cannondale, known first for its popularization of aluminum bike frames back in the 1980’s, and later its carbon innovation and the BB30 open bottom bracket standard, released its new category-creating bike, the Slate, this past fall. 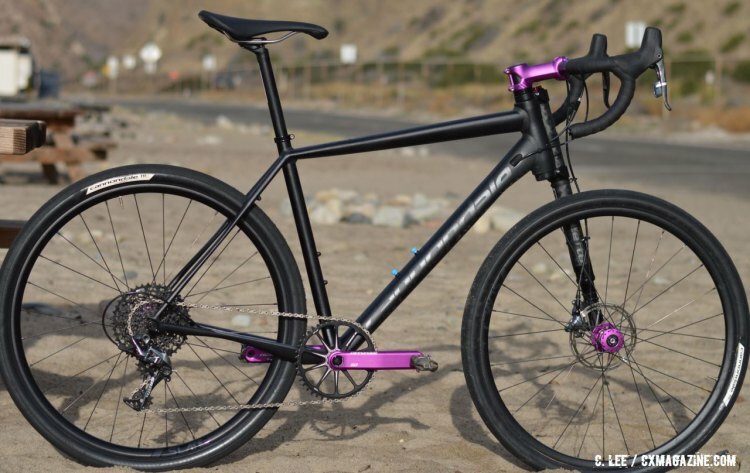 We had a chance to see and ride the Slate in sunny Malibu, California, to see where this bike fits into Cannondale's, and perhaps your, stable of bikes, and whether a cyclocrosser or gravel racer needs a bike like this. 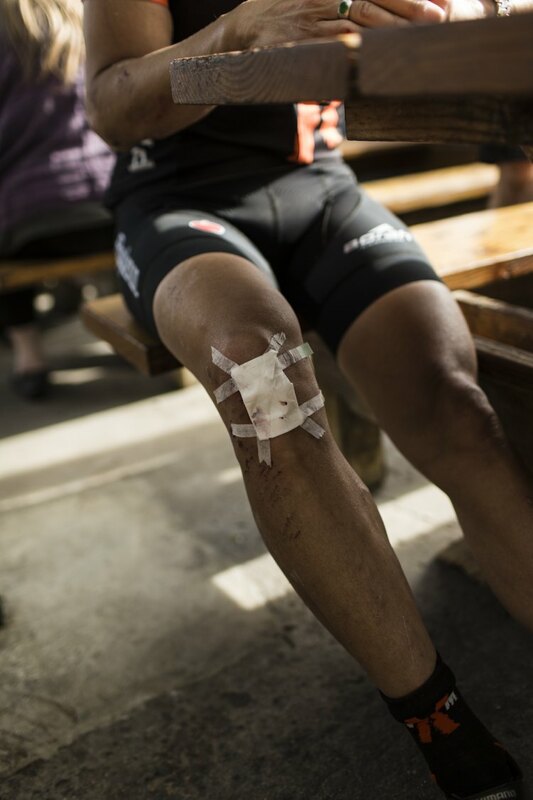 With offseason adventures calling, and gravel season looming, we're bringing you our initial impressions about the Slate now, and we have a long-term test underway. 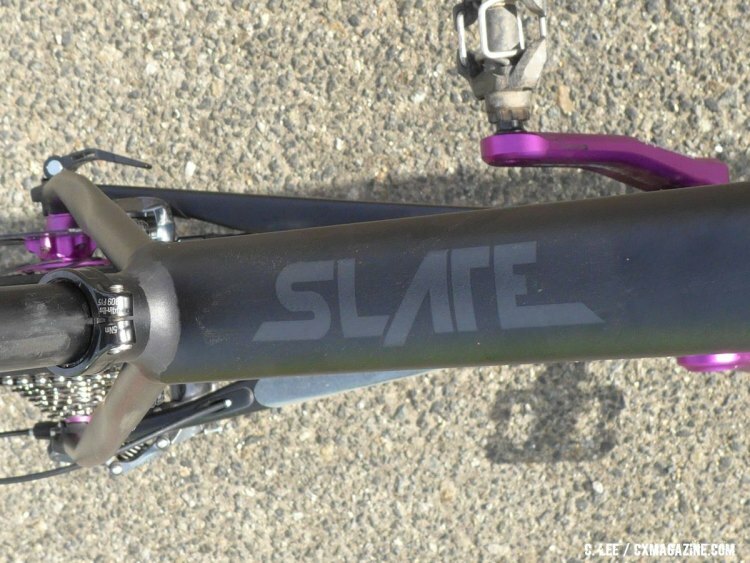 The Slate in a nutshell is a bike that includes the gamut of Cannondale’s technologies and innovations: BB30, Hollowgram Si cranks with SpideRing, Smartformed Aluminum tubing, SAVE micro-suspension technology and the iconic Lefty fork. 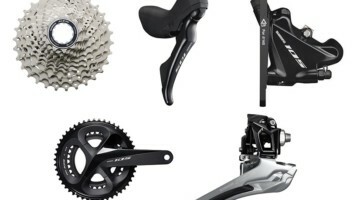 Cannondale has developed all these technologies over the years and applied them all with some Slate-sopecific modifications for use on the 650B-wheeled machine. The 650B wheel, popular in Europe for years, never really caught on in the US despite efforts from some small bike companies. However, it gained serious traction in America two years ago when the mountain bike industry adopted it as the 27.5" size (not to be confused with the much larger 27" wheel size of older road bikes). 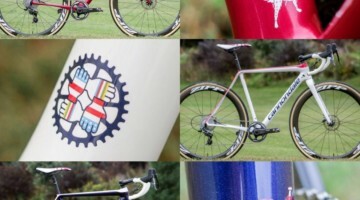 Now 650B rims and wheels are ubiquitous in the US. A 42mm tire, like that found on the Slate, on a 650B rim is the same rolling diameter as a 23c tire on a with a 700c rim. 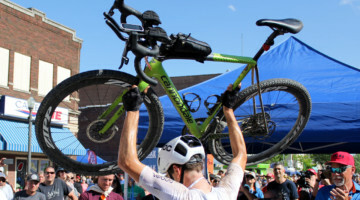 Using that knowledge, Cannondale looked to Panaracer to help design a 42mm performance tire that is light, supple and tubeless. The resulting tubeless 42mm tire with a fine herringbone tread and supple nylon casing weighs just a bit more than a 23mm road tire. I was told unofficially that the tire's weight was 330 to 350 grams. 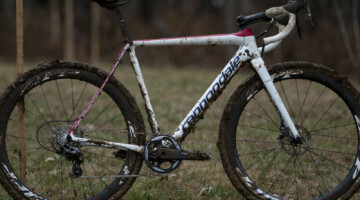 Cannondale’s goal with the Slate was to create a bike that was fun to ride. Not fun to race, or shred, or tour but fun to ride almost anywhere. The idea was a fast-rolling, drop-bar bike that offered comfort and control over a variety of surfaces. Unlike a 'cross or gravel bike, the 650B wheel diameter with a wide tire is the same as a road bike, keeping the bike lower to the ground. With an entry point of of $2,980.00 USD for a Shimano 105-equipped model, a $3,520.00 USD Ultegra model, and a $4,250.00 USD SRAM Force 1 model, this bike is aimed at enthusiasts. That could be a beginning enthusiast looking for something that will cover a variety of surfaces, or a seasoned enthusiast looking to fill a void and go places his or her other bikes can’t tackle. The frame is a 6069 Smartformed, TIG-welded aluminum tubing with Cannondale’s signature smooth-finish welds. The tubes have flowing shapes with vertically flattened chain and seatstays allowing slight flex vertically, constituting the SAVE system for the 142mm spaced rear end. The rear brake caliper direct mounts are small forged pieces that are low temperature brazed to the chainstay for a light, strong system. The 650B wheels allowed a fat tire with short chainstays: 40.5cm short to put the rear wheel under the rider for traction and sprightliness. That is balanced by a 601 front center 100cm wheelbase with a 56cm effective top tube on the medium sized sample I rode. With a 6.7cm BB drop, and 71.5/74.0 degree head and seat tube angles respectively, the geometry begins to sound a bit 'cross bike like. For reference, A size large frame is 1200 grams. 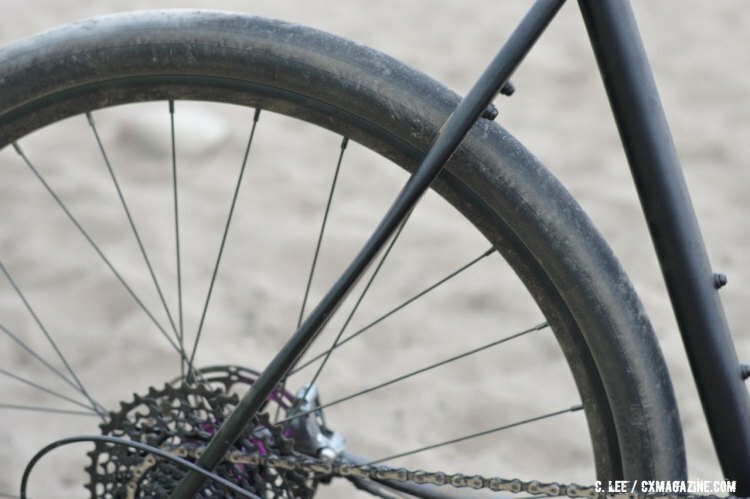 Most important to the Slate is the Lefty Oliver fork, a new 30mm travel suspension fork designed specifically for the Slate after several prototypes. It is air adjustable, with pressure recommendations on a chart printed on the fork leg in case you forget. There is essentially no sag, so that simplifies things as well. The fork has damping control and an easy lockout for climbing, with a blow off platform that will open the valve should you have a hard hit when locked out. The lockout is definitely firmer than the mountain bike Lefty when locked out and features a a carbon body with an aluminum stanchion. 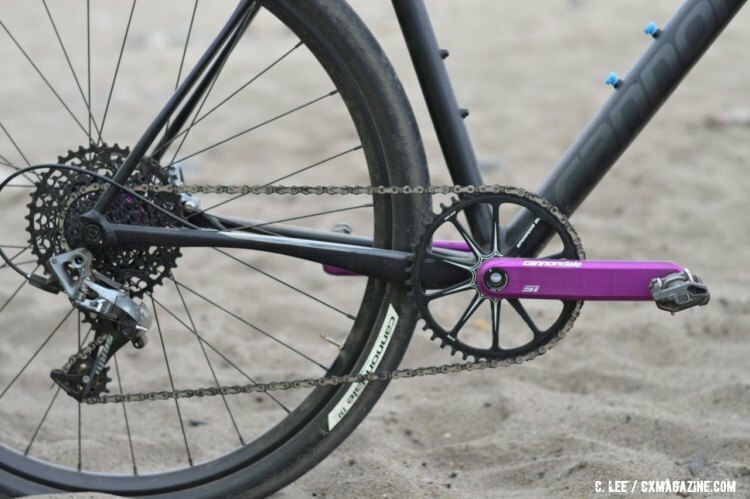 The wheelset uses purple anodized Cannondale hubs, the rear with an XD driver to fit the 10-42 SRAM cassette and the front specific to the Lefty fork. The aluminum rims are laced with 28 bladed spokes. The bike I rode, in the company of Tim Johnson and Ted King, up through the roads and trails above Malibu, California, was built with the SRAM Force 1 kit except for the Hollowgram crank with the machined wide-narrow SpideRing with 44 teeth. 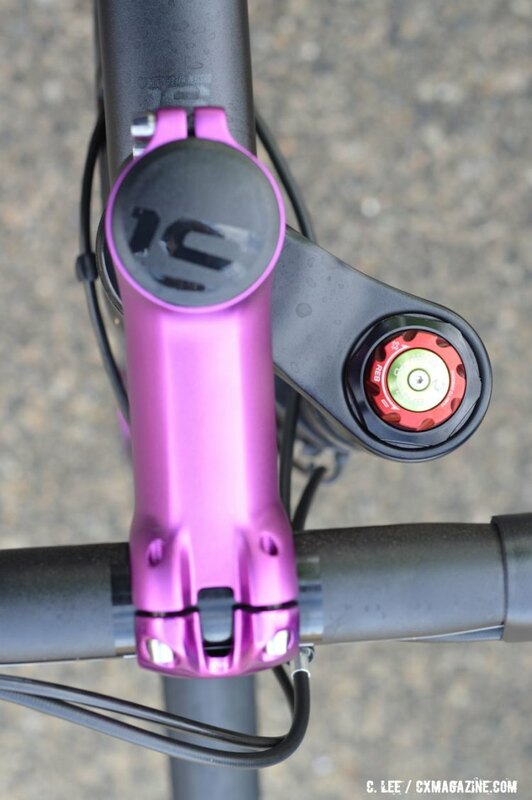 The cockpit and seatpost was Cannondale branded, with a purple anodized 100mm stem that dropped 5 degrees. The purple can't help but remind me of the early 90s. We started the ride out with the fork set up at the recommended 10 psi less than body weight and the tires aired to 45 psi as recommended by Tim Johnson. Our first 15 miles were on pavement, most of it relatively smooth that included a several miles-long climb up Decker Road. The big, tubeless tires make a bit of noise in the paceline, especially since all 12 of us were on them. I kept looking over my shoulder thinking a car was shadowing us. Our own Clifford Lee (right) putting the Slate through its paces in the company of Tim Johnson and Ted King. On the flats leading up to the climb I tried riding with the fork locked out versus open and while seated there was no difference until you hit a crack in the road or roll over a bump, then the open fork definitely takes the edge off the hit. This becomes more obvious when on a bumpy paved descent, letting the front tire, already tacky from the large footprint, stick to the ground. Descending, I noticed that the bike exhibited a bit of understeer, but I quickly got used to the feeling and adjusted to it. During the long climb, I found I preferred the fork locked out, especially when I stood on the pedals. However, even in the open position, the fork is firm enough that its compression is not objectionable. Once on the dirt, the bike came into its own. 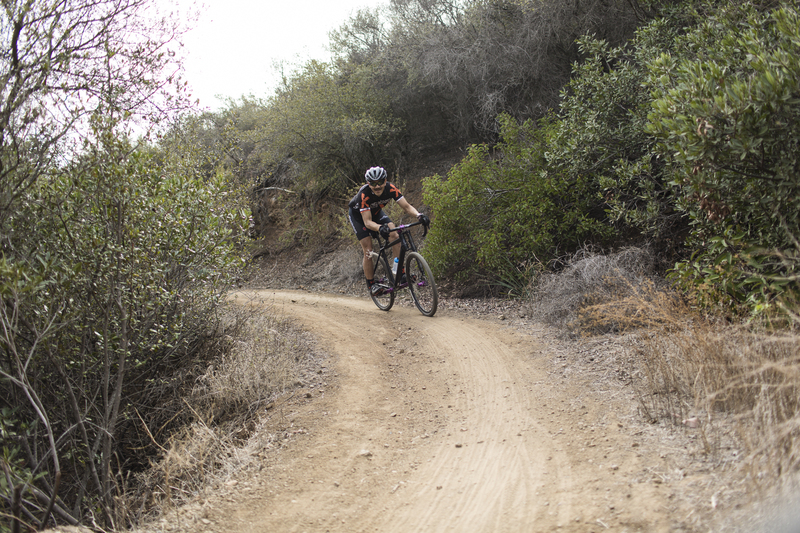 The trails above Malibu are hard packed with surface dust and buried rocks. Off road, I varied the tire pressure, dropping it to 35psi based on Tim Johnson’s advice for my 155 pound weight. He said the tire would bounce and corner less predictably if it's too soft. I’m used to riding around on tubeless 'cross tires at less than 30 psi, but those are usually 35mm or less. The wide supple 42mm tire actually felt a bit similar. Clifford Lee opens the Slate up on what is really its natural habitat. That adjustment, combined with the Lefty fork, offered great traction over the rocky sections and hardpack, but as I was to find out, once the smooth tire breaks loose in a turn, it does not hook up at all and slips out from under you as if on ice. With some side knobs on the tires I would be able to rip those trails, but perhaps to the detriment of where the bike really excels, along road descents with smooth wide sweepers or tight chicanes. On the way back to Malibu, I found the SRAM 1 lacking steps as I tried to find my cadence in the pace line, though I never even thought about it on the trail. To me, that’s a testament that riding on pavement and dirt have different gearing needs, and if you need that large cog on the back for the dirt, it will come at a price on the road. 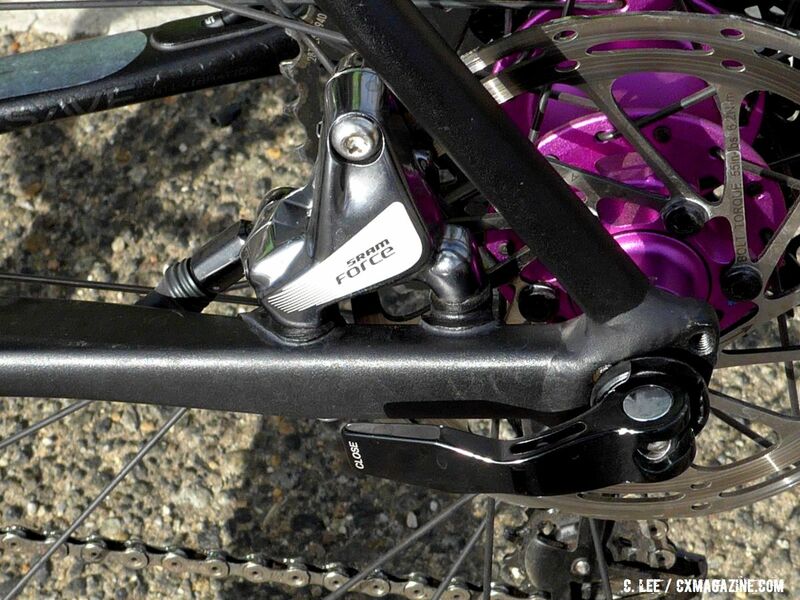 SRAM Force 22 could solve this. The Slate is a fun bike. It’s the bike you want when you’re not sure where your ride will take you. It’s quick on the road, and more than just capable on the trail. A road bike is better if the ride is pure road, and a mountain bike better if there is a majority of dirt on the ride. 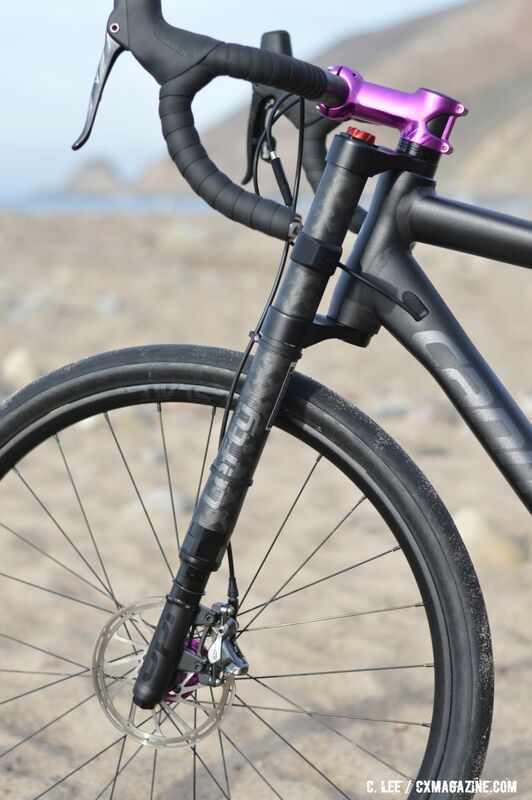 Arguably a cyclocross or gravel bike fits this category, but the Lefty Oliver fork dialed for the Slate adds additional control since you don’t rely solely on tire pressure for suspension. The perils of hard work...forgetting you're cornering on loose dirt with slicks. I also think the 650b with the 42mm road tire puts the bike in a different category. It adds the sort of fun that reminds me of when we all took old all rigid steel 26er mountain bikes and put slicks on them. Only, this is the grown up, modern version. Though the Cannondale Slate uses parts that are readily available for the person who wants to tinker a bit as 650B rims and tires and Lefty hubs are not that hard to find aftermarket, you’ll have to get the Slate’s 42c Panaracer tubeless road tire only from Cannondale dealers for now, although WTB's new Horizon is an option, albeit a wider one. We will be getting a demo model for prolonged testing, but the Slate is available in stores now. Like the look of the bike but purple uh. SRAM e-tap 1X11 now that would be something. Why create this? A cross between two types of bike, creating one that is not as good as either separately. The new WTB tire is a lot bigger than Pana slate 42 tires. Is there enough room on the slate frame for the WTB tires? 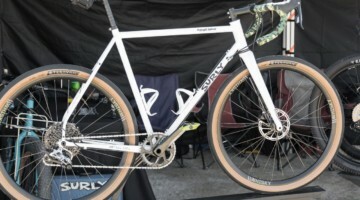 Grand Bois and Compass tires in 650b X 42 have been on the market and have had a loyal following for years, and Compass are now making a tubeless model, so take a look if you want to try out fat, fast tires on a disc cx bike. Lovely bike, would love one. Trip back the early 90’s with the purple anodising! Cos people will buy it? Isn’t the job of a bike company to make bikes that people will then buy? Tom Ashworth exactly, the transparency of it makes it so much worse. Just like the new trends, 27.5+ and those wider crank axles, wheel axles etc. Why would anyone buy a heavy aluminium cross bike thats not really a cross bike? Surely someone would rather have a 8kg carbon cross bike for the same cash? Or even a short travel 650b hardtail mtb, even with a rigid fork maybe?